Mario Balotelli is without doubt a footballer who, to coin a clichéd phrase, is a lot like marmite – you either hate him or love him. There is very rarely any middle ground when it comes to this particular young man. As I sit here, sipping on a fresh cup of tea and typing away, I can’t help but think back to an argument I had today, an argument I often have with people, an argument discussing the ability of Mario Balotelli. As I think back to the argument, I can’t help but laugh. Only a matter of hours after the discussion of Balotelli’s ability, during a friendly between Brazil and Italy, he beautifully placed the ball into the top corner of Julio Cesar’s goal from 25 yards, leaving the Brazilian goalkeeper with no chance of getting anywhere near the shot. It’s almost as if he did that just to reassure me that I was right, and that he is in fact brilliant. I happen to be a keen admirer of Balotelli. It is a far too regular occurrence for me to be involved in a discussion in which I will find myself endlessly defending the ability of the controversial Italian front man and telling those who disagree with me to “look at the stats from when he plays.” There is absolutely no doubt in my mind that Mario Balotelli is an astonishing footballer. I do not understand the view shared by so many that his ability is nothing worth getting excited about and I personally feel we should be screaming from the rooftops about just how brilliant this boy is. Firstly, let’s take a quick look at his recent form. Since moving back home to Italy to play for Milan, Balotelli has scored seven goals in six league games, of which he started five. Seven goals in six matches, which works out as being an average of a goal every 73 minutes. He has notched up a total of eight goals in eight games this calendar year. This is pretty black and white for me. This form is outstanding. However, to refer to the well-known saying that form is temporary and class is permanent, I’ll show you that the boy has class too. In his time at Manchester City, Balotelli came under a lot of criticism from fans of the English game. People are quick to remind you how he carelessly got sent off in a vital game against Arsenal which almost ended City’s title hopes, but are a little more forgetful when you respond by pointing out that he returned to the side to provide a brilliant assist for that Sergio Aguero goal that clinched the Premier League title. That wasn’t even his only contribution in that match. Coming off the bench when his side were a goal behind, he played brilliantly, he changed the game. Critics are either extremely forgetful or choosing to ignore the fact that he scored twenty goals in forty games that season also. A record of a goal every two games which in a world without Lionel Messi and Cristiano Ronaldo, is a brilliant return. His overall record at Manchester City is nothing to turn your nose up to either. In a total of eighty games for the club, he found the net thirty times. Not bad for a player who is still developing and maturing as a footballer, as well as a person. It is not only with his club that he has been performing to a very respectable standard. For Italy he has played a total of eighteen games, scoring six times. The peak of his international career to date was without doubt his performances at Euro 2012, where he had a return of three goals in his six games and had the whole of Europe talking about him. 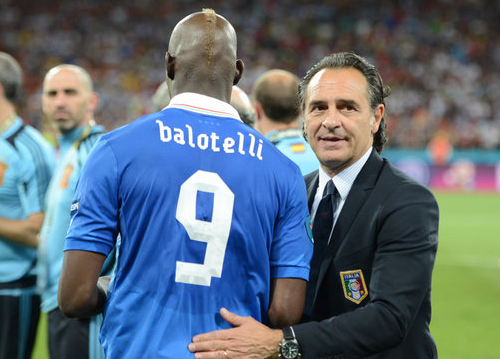 He helped Italy to reach the final where the eventually fell short against Spain. Another attribute of Balotelli’s which makes him stand out as a world class player is that he scores in big, important matches. As stated above he scored three times in the European Championships for Italy. Two of these goals coming in the Semi-Finals against the highly tipped Germany. As well as this he has scored against many top teams in England. He put Manchester City 1-0 up at Stamford Bridge in a game against Chelsea in Manchester City’s title winning season. In the same season he scored a crucial last minute penalty at home to Tottenham which kept his side top of the league. The tension within The City of Manchester Stadium was felt by all who were watching and Balotelli seemed to be the most composed person in the ground as he strolled up to the ball and nonchalantly stroked it into the bottom corner. As well as these big games, he also scored against tough opposition such as Everton, Newcastle, Napoli and Manchester United in this season. I will come to his goal in the derby soon. Certain people really don’t know how to make money in life and therefore try to take advantage of others. Gossip is one thing, but what these people do is close to criminal. Many stories are invented about me, I’d say about 0.01% of them are true. Who uses me? Almost everyone. One story, however which caught the eye of everybody was the infamous firework incident. In the aftermath of this, came one of Balotelli’s most explosive days in English football. (Sorry, I couldn’t resist.) The game following this incident was none other than the Manchester derby, arguably the biggest game in English football since the blue half of Manchester became realistic title challengers. It wasn’t long before Mario was making headlines for all the right reasons. He opened the scoring with a typically calm finish from just inside his opponent’s box where most would have put their heads down and laces through the ball, he kept his head up, opened up his body and trickled the ball into the far corner past the despairing David De Gea. Scoring two goals in the home of his side’s most fierce rivals and helping his team to an historic 6-1 drubbing of their Manchester counterparts it was nice to hear that the whole country was talking about Balotelli and his t-shirt for all the right reasons. Another thing which is interesting about Balotelli is that he’s not your typical striker. He does not have any one defined position. He is versatile. He can play as a target man, on the shoulder of the last defender, as a second striker, out wide, you name it. This is a wonderful characteristic for a striker to have. It allows him to be utilised in many different formations and playing styles and to cause opposing teams a number of different problems. It must not be forgotten that while at Internazionale, Balotelli was one of Europe’s hottest young prospects. He has shown that he is capable of performing to the heights expected of him, he now just needs to show that he can do it on a more consistent basis. If he can do this, he will inevitably begin to win over his critics sooner rather than later. Balotelli is a phenomenal talent. This can simply not be debated in my view. He has won everything available to him in club football by the premature age of 23 and has a European Championships runner’s up medal to go along with those honours. I cannot think of another player who, if they had achieved what he has achieved would face such unjustified criticism. Mario Balotelli should be judged by what he does as a footballer, not by what he does or is reported to do in his private life. If this is the case, it cannot be denied that he is a wonderful talent who is only going to get better as he matures. the majority of the gols in Milan came from penalties and free kicks. In Premier Laague he scored 20 goals in over 50 games. Statistics which is ok but far cry from being outstanding. What’s more, his attitude on field is often ridiculously lazy.